Borrelia | David C. Wright, M.D. Dr. Wright drew attention to two figures from this article. 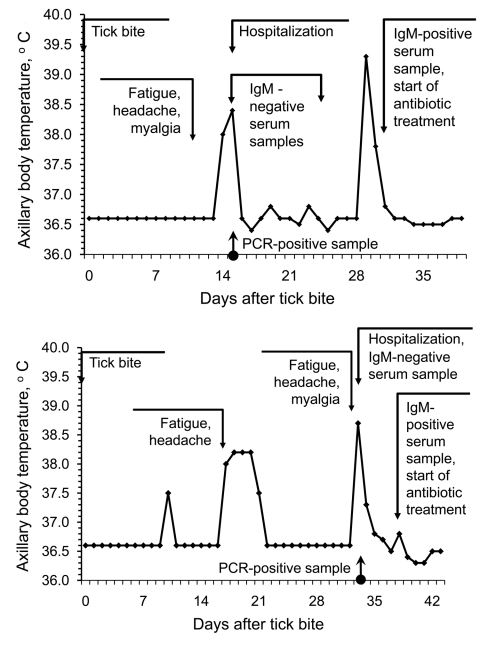 This figure illustrates that an antibody test can be negative at anywhere between 15 and 37 days post-tick bite, even though a PCR may be positive. Each graph above represents episodes of relapsing fever in one patient from the study. During the time that both patients were hospitalized with high-spiking fevers, antibody tests for Borrelia miyamotoi were negative. Antibiotic therapy was not initiated until 30 days after the tick bite. If the patients had been infected with Rocky Mountain spotted fever instead of Borrelia miyamotoi, some would likely have died waiting to get treatment. In cases where doctors are not sure which tick-borne infection a patient has–because symptoms of fever and myalgia come with many infections–it is important to start antibiotic treatment right away. Dr. Wright reminded the group that, according to Israeli studies on Borrelia persica, prophylaxis does not work at 72 or 96 hours. If treating a patient with antibiotics later than 48 hours after a tick bite, doxycycline should be given for at least two weeks. Phylogenetic tree of Borrelia spp. detected in persons and ticks, based on flagellin gene fragment (A) and16S rRNA gene fragment (B). Sequences were aligned and analyzed by using MEGA4.1 software (www.megasoftware.net). Genetic trees were constructed from the partial nucleotide sequences of the flagellin gene and the 16S rRNA gene by using the Kimura 2-parameter model and the unweighted pair group method with arithmetic mean. Arrow indicates the 16 Borrelia spp. from Yekaterinburg in 2009 that had the same nucleotide sequence. Circles indicate sequences that we listed in GenBank (accession nos. GU797331–GU797346 and JF951378–JF951392). Sequences for B. burgdorferi sensu lato and relapsing fever borreliae are shown for comparison. Scale bars indicate genetic distance. There appear to be three main types of Borrelia miyamotoi: 1) Russian/Asian, 2) European, and 3) U.S. and Japanese. It’s possible that we have an undiagnosed Borrelia miyamotoi epidemic. It’s already been detected in wild turkeys in the U.S. If we had commercially-available tests for it, we’d likely be detecting it in people, too. People who test positive for Borrelia hermsii with a low antibody titer could have Borrelia miyamotoi. Researchers say that species like Borrelia hermsii that cause Tick-borne Relapsing Fever are only carried by soft-bodied ticks, but Borrelia miyamotoi is carried in two different U.S. species of hard-bodied ticks. If there is one exception, there are likely others. Dr. Wright mentioned a case of a child with “atypical psychosis” who turned out to have a Borrelia hermsii infection, and recommended that patients with psychiatric disorders of an unknown origin be screened for Borrelia infections. About 25% of cases of Bell palsy in Canada are due to Lyme disease. A facial palsy is a neurologic presentation of the infection, which means doctors missed the infection in its acute stage. For this reason, Dr. Wright believes it is more effective to treat patients with Bell palsy with IV ceftriaxone (as opposed to oral doxycycline). In this study, researchers only looked for one isolate of Borrelia burgdorferi. It’s possible that if they had looked for multiple isolates, greater than 25% of Bell palsy cases would have been due to Borrelia infections. Borrelia persica is a relapsing fever species commonly found in the middle east and has been studied extensively by Israeli scientists. In this study, they find that adult respiratory distress syndrome (ARDS) can be a complication of Borrelia persica infection. ARDS is a known complication of Borrelia hermsii infection as well. When a patient has ARDS, fluid accumulates in the lungs, and the patient has to be put on a ventilator. Dr. Wright suggests that perhaps we should be screening patients on ventilators for Borrelia infections. Clarithromycin and amoxicillin differ from ceftriaxone and doxycycline in that they cannot cross the blood-brain barrier. In advanced infections with neurological symptoms, it is important to be treated with an antibiotic that can cross this barrier. To date, Dr. Wright knows of no study of prophylaxis in children; this would be helpful to have. Dr. Wright discourages patients from letting their pets sleep with them in their beds, as this is how many zoonotic infections can be spread. He also stresses the importance of keeping one’s house free of rodents (which carry ticks). “We still haven’t learned the Middle Ages lesson about rodents living with humans,” Dr. Wright said in reference to the bubonic plague.